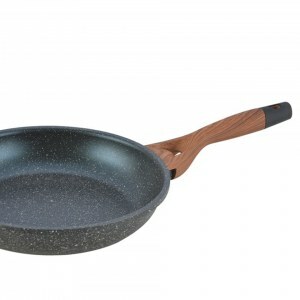 The high-end brand Herzberg offers a frying pan with marble coating without PFOA. The non-stick coating makes it possible to prepare dishes without fat and especially without attaching the frying pan. Another advantage, it is compatible to go into the dishwasher to save time after cooking! The non-abrasive sponge is essential to take care of it. After each use, wash the inside of your frying pan with water and washing-up liquid. If the pan sticks, let it sink into the sink for a few minutes. PFOA, a kind of glue that can fix the coating, is an endocrine disruptor possibly carcinogenic. This substance can migrate during heating at very high temperatures. Before buying a frying pan, it is best to check that this chemical component isn't present in the composition of the coating in contact with food.